Updated at 5:09 p.m. on Tuesday, Feb. 12, 2019, with more information. 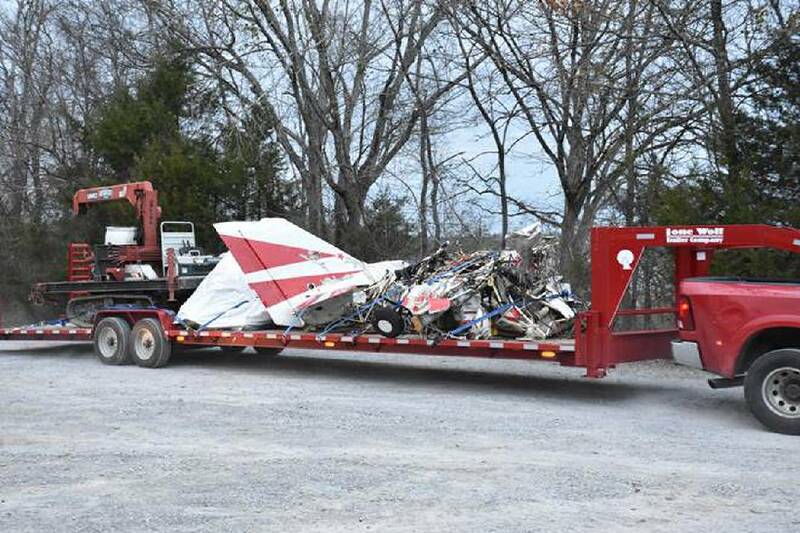 A preliminary report from the NTSB offers some new details about January's fatal plane crash in Soddy-Daisy, but what exactly contributed to the plane's downfall remains unclear. A witness told federal investigators that the aircraft made a U-turn at low altitude before plummeting into Chickamauga Lake near Camp Vesper Point just after 1:30 p.m. on Jan. 7, according to the report released on Feb. 8 by the National Transportation Safety Board, the federal agency that investigates all civil aviation crashes. Pilot Frank Davey, 67, and his passenger, Lynda Marinello, 55, were killed on impact. Their remains were recovered from the wreckage days later on Jan. 10, and the plane itself was brought up the next day. The flight originated from Dallas Bay Sky Park, according to the report, and Times Free Press news partner WRCB News Channel 3 reported airport officials said the plane was taking a "scenic flight" and was not headed to another city. The report says no fight plan had been filed that day. But that isn't unusual for local flights, an NTSB spokesman said Tuesday. Flight plans are usually filed for flights that cover a longer distance. The sky that day was mostly clear with scattered clouds and a visibility of about 10 miles. A witness told investigators he was in his home watching the airplane fly over the lake from his study. "He noted that the airplane appeared to do a tight U-turn at a low altitude, about two or three treetop lengths above the water, which he initially thought might have been aerobatics," the NTSB report states. That is when the plane spiraled down counterclockwise and struck the lake. The witness then contacted emergency services and assisted local responders in finding the wreckage. At the time of the crash, a local resident told the Times Free Press he saw the crash and called 911. "I was looking out of the window and it looked like it did a tight loop and it started to spiral down," said the man, who declined to give his name. "I thought it was doing an acrobatic [maneuver] and lost control. Then I saw the crash. I could see the splash on the other side of the cliff." The report says the plane's airframe was found, but the engine and propeller were not. A GoPro camera also was recovered. It was mounted on the right horizontal stabilizer, and data from the camera was sent to the NTSB Vehicle Recorders Division in Washington, D.C., for examination. The findings of that information likely will not be released until the final NTSB report, which may take up to two years to be completed. The plane was a four-seat Bellanca 1730-A owned by Davey and was inspected on June 1, 2018, the report states. At that time, the airframe and engine had accrued 2,156 total hours since new. That is nearing the benchmark for an engine overhaul, an ATP Flight School spokesman said, but it wouldn't be a red flag if the aircraft was maintained properly. The reports says Davey held a commercial pilot certificate and had most recently been issued a second-class medical certificate from the Federal Aviation Administration on Feb. 1. That certificate for a pilot over age 40 is good for one year, FAA spokeswoman Kathleen Bergen said. Davey had total flight experience of 3,800 hours, according to the report. Marinello's daughter, Alaina Marinello, said the family is anxiously but patiently awaiting more definitive answers as to why the plane went down. "We're just stuck in the waiting period as everyone else is," she said. "At least the preliminary report came out, and that's good. [It] makes me feel better knowing they're working toward answering the questions, and that gives me peace of mind. [We] appreciate their efforts. It [isn't going] unnoticed." The investigation was initially delayed by the partial government shutdown, as were other investigations across the country. Work stopped on 1,815 ongoing aviation safety investigations, 33 ongoing rail, pipeline, and hazardous materials investigations, 44 ongoing marine investigations and 21 ongoing highway investigations, according to an NTSB news release. But with another shutdown looming, NTSB investigations could again grind to a halt if White House and congressional leaders don't strike a deal to fund President Donald Trump's border wall by Friday.